And it’s an entirely winnable one too. Mark Reckless managed a majority in Rochester & Strood of just 2,920. A swing of 3.65% would see the Conservatives take the seat back. This is on a par with the likes of Berwick-on-Tweed, one of the Tories’ tougher Lib Dem targets but a seat that polling suggests they could win. The party has to now find a candidate to fight Rochester in 2015, of course. Given they’ve yet to do likewise in Clacton, this could take some time. 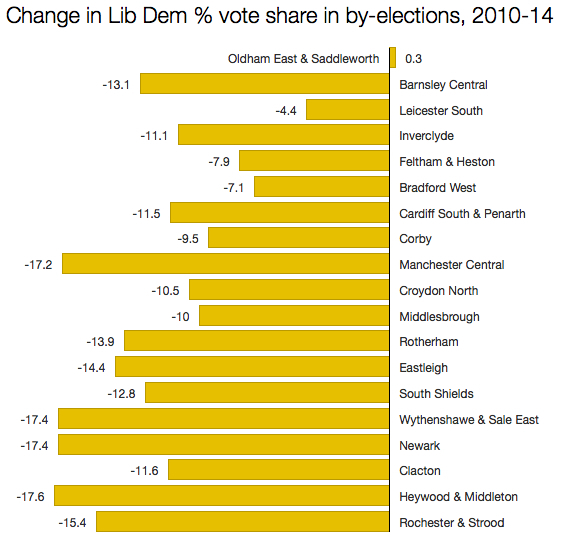 There has been a striking consistency to the turnout in recent by-elections where Ukip is the main challenger. In Newark in June 2014 and Eastleigh in February 2013 the figure was exactly the same: 52.8%. In Clacton in October 2014 turnout was 51.2%. In Rochester yesterday it was 50.6%. It’s a remarkable pattern. But in every case the number has been lower than that at the 2010 general election, which in Clacton was 64.2% and Rochester 64.9%. I feel a bit like a broken record on this subject, but as long as Ukip continues to indulge in the inflation game, so it’s necessary to repeat this message. The party will not be large enough to hold the balance of power after the next election. My guess is that it will be, at best, the sixth largest party in parliament, behind Labour, the Tories, the Lib Dems, the SNP and the DUP. Even then, nobody but the Tories would countenance working with them. And the Tories will need far more than, say, six extra MPs to form a coalition if they continue to bump along in the low 30s in opinion polls. 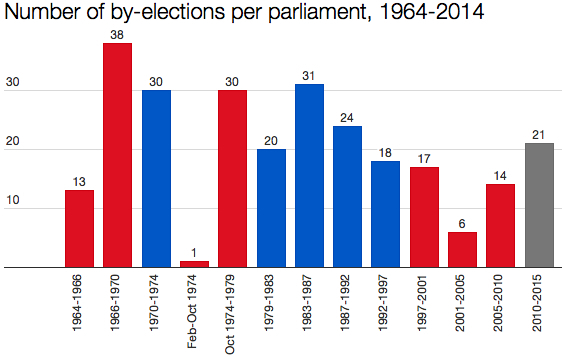 There’s no rule or tradition that says by-elections can’t take place in the months immediately before a general election. The contest in Wirral South in February 1997 was a little over two months before polling day. I’ve a feeling we won’t have to wait until May to see ballot boxes again. I don’t dispute that the Tories could win this seat back, but achieving a swing of 3.65% against a party on a roll is a very different proposition to getting a swing of 3.65% in Berwick against a party that is sinking like a stone.